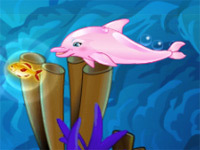 Penguin Diner 1 is an online flash based game where the player has to help Penny, the Penguin serve customers and make money. You will be given a target for each day and your objective will be to achieve that target before the restaurant closes for the day. You will be able to buy certain products with the money you collect which can be used to decorate the diner or to help increase the speed of the service. Penny is a Penguin who gets lost on a trek to Antarctic and is found stuck on top of an icy mountain. She does not have money to get back and hence has to work in a local diner as a waitress to make enough money to go home. The game is a point and click game. Keyboard is not really required for this game. The whole game can be played with a mouse. You will have to point at the right place and do a mouse click for some action to be performed. When the game is started, you will be given a target for the day. The diner will close by 9 o clock and the target should be achieved before that time. If the money collected is higher than the target, the extra money will go into Penny’s bank. This money can be used to buy upgrades. Customers will line up at the front of the diner. You have to click on the customer and click on an empty table to seat the customers. Once they are seated, they will start reading the menu card. Once the customer is ready to place an order, the customer penguins will call saying ‘Hello’ and waving. When you click on the table, Penny will be able to reach the table and take the order. Orders taken are automatically passed on and the prepared food will be placed on the counter at a side. You have to click on the food and click on the table where food has to be delivered. Once a customer has finished the food, he will leave the place leaving a tip behind. Clicking on the finished table will help penny collect the tips and clean the table. Once the service for the day is complete, you can choose to start the next day. The scores will be added up with the previous game. If the service takes too long, a customer might become angry and leave the dishes unfinished. In such case, Penny has to throw the uneaten food into a trash can which is also present in the diner. Speed is an important element in the game. As the service is faster, Penny will get to collect bigger tips. Penny will be able to carry two trays of food in one go. The game progress is saved even when you perform other navigations. When you play the game again, you will be given the option to resume the game from where you left off or to start a new game. With the money that is in Penny’s bank, you can opt for upgrades. The upgrades get expensive as you move up. In this game, you will get a skates for penny to help her move faster, comfortable seats to make customers more comfortable and to get more tips and a tv to make the customers wait patiently. I finished the game, now what? Good for you! You can play the second version or try some other penguin games.